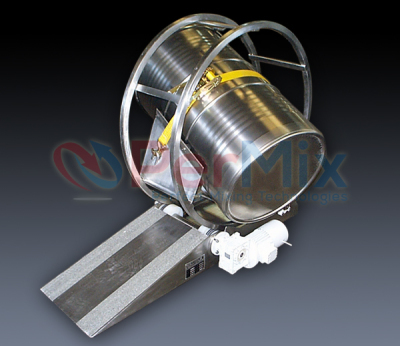 The PerMix PDR series Drum Mixer has been developed to meet increasing demands for a low batch mixer for mixing, blending, homogenizing, dyeing of dry powders and granules particularly in smaller industries or when frequent product changes as required. 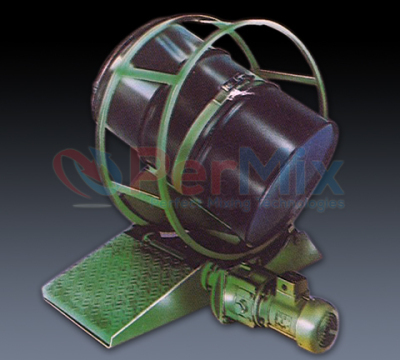 PerMix PDR series Drum Mixer comprises a drive unit with roll-on / roll-off ramp and foot switch or timer, and it is used in mixing, homogenizing and dyeing of powdery or granulated components in the plastics industry, chemical industry, drug and dye works, food industry as well as textile and leather industry. Drum capacity of PerMix PDR series Drum Mixer is usually 200L, but also available with 25, 50, 100 and 400 liters. No need for drum hoists, cradles, etc.